Sripada Bhaktivedanta Vana Mahara was born in the Midnapura district of West Bengal in January, 1959 near the Pada Tirtha of caitanya Mahaprabhu called Pichalda mentioned in the sri caitanya-caritamrita, since his boyhood, maharaja was very attached to Sri Caitanya Mahaprabhu and Sri Nityananda Prabhu and worshipped their lotus feet. He received his bachelor degree in Economics from Calcutta University in 1980. His uncle, Sripada Bhaktivedanta Madhusudhana Maharaja, who is to this day temple commander of the Devananda Gaudiya Math inspired him to dedicate his life to the service of Sri Radha and Krsna. In 1981, Maharaja joined the Gaudiya Vedanta Samiti, and would regularly hear hari katha from paramapujyapada nitya lila pravista astottara sata sri srimad bhakti raksaka sridhara Gosvami Maharaja who blessed him, and asked Maharaja to stay in his temple. However, Maharaja was very attached to Srila Bhaktivedanta Narayana Gosvami Maharaja. 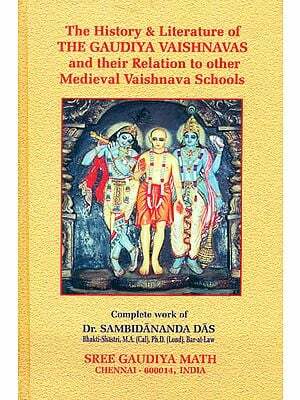 Srila Narayana, Gosvami Maharaja instructed Sripada Vana Maharaja how to enter in Vaisnava philosophy, and he would daily give a special class on Jaiva Dharma, Brahma-Samhita, Bhagavad gita, the sandarbhas, as well as other Vaisnava literature. Srila Bhaktivedanta narayana Goswami Maharaja gave Sripada Vana Maharaja Harinama and after six months, he received diksa from Srila Bhaktivedanta Vamana Goswami Maharaja, the President and acarya of the Gaudiya Vedanta Samiti at that time. Today by the causeless mercy of the lotus feet of my most worshipful spiritual masters, nitya-lila pravista om visnupada astottarasata Sri Srimad Bhaktivedanta Vamana Goswami Maharaja and my siksa Guru Nitya-lila pravista om visnupada astottara-sata Sri Srimad Bhaktivedanta Narayana Goswami Maharaja, this edition of Sri sva-niyamadasakam composed by Sri Raghunatha Dasa Goswami, the Pre-eminent follower of Sri Rupa Goswami, is being happily presented before the faithful readers. The Commentary found in this edition is called Narayani vritti. Sri-sva-niyama-dasakam, written by Sri Raghunatha Dasa Goswami, the eternal associate of Sri Caitanya Mahaprabhu, is a collection of ten vows that offer spiritual instructions to mind. Sri Raghunatha Dasa Goswami appeared in a respected and fabulously wealthy family of Kayastha landholders in a village called Krsnapura (Saptagrama) within the Hugali district of West Bengal around the year 1494. His father’s name was Sri Govardhana Majumdara. Sri Govardhana’s older brother’s name was Hirayana Majumadara. Although both brothers were opulent landowners, they were devoutly religious and maintained tremendous respect for and faith in the Vaisnava sadhus. The Renoned devotee of Sri Caitanya Mahaprabhu and the Acarya of the holy name, Sri Haridasa Thakura, used to visit their royal court. Their spiritual master, Sri Yadunandana Acarya, the initiating guru of Sri Raghunatha Dasa Goswami, was an intimate disciple of Sri Advaita Acarya and a close friend of Haridasa Thakura. In His childhood Raghunatha Dasa received the association of pure devotee such as Sri Haridasa Thakura and Sri Yadunandana Acarya, and in his early youth he met with Sri Nityananda Prabhu and his associated. This influence left a very deep impression on him in regard to unalloyed devotion. As a result the very quickly renounced wealth comparable to that of Indra, the king of the heavenly realms, and a wife who was as beautiful as a heavenly damsel. He then went to Puridhama and submitted himself at the feet of Sri Caitanya Mahaprabhu, who entrusted him into the hands of His second self, Sri Svarupa Damodara. Since that time he became known as Svarupera Raghu’ or the raghu of svarupa, and by his mercy he acquired the eligibility to render intimate service to Sri Gaurasundara. Being very pleased with his unflinching dedicationto bhajana and exemplary renunciation Sri Gaurasundara endowed him with the eligibility to serve Sri giridhari in the form of a Govardhana-sila and sri Radhika in the form of a gunja mala. After Sri Gaurasundara withdrew His Pastimes from the view of this world, Sri Raghunatha Dasa became overwhelmed with the agony of intolerable separation. He left Puri Dhama and went to Vrndavana with the intention of giving up his life by throwing himself off the peak of Sri Govardhana hill. There however, Sri Rupa and Sanatana Goswamis convinced him to give up this idea by showering him with the nectar of their mercy and sweet krsna Katha from that time he became their third brother and took up permanent residence on the bank of Sri Radha-Kunda. At Radha kunda he remained deeply immersed in worshiping Sri Radha Govinda in the mood of separation with severe and unearthly renunciation. At the advanced age of approximately one hundred years, while performing this standard of bhajana, he entered into the unmanifest pastimes of the Divine Couple by entering into Sri Radha Kunda. He is understood to be Rati Manjari in vraja-lila.